subscriptions to lists all from the 123-txt platform. 123-txt allows you to add individual contacts as you go. In addition to the usual contact information fields such as First Name, Last Name, Company, Email, Mobile Number etc., you can add an unlimited number of custom fields to allow you to organise contact lists, personalise messages and automate some SMS related processes. As well as the manual inputting of contact information, you can bulk upload from CSV files. 123-txt is equipped with an incredibly useful data scrubbing tool so that when you bulk upload, your contacts can be cleansed of duplicates and bad numbers. This is especially useful when conducting large, one-off marketing campaigns or info blasts. If you already have a contacts database in the form of a CRM or digital address book, you will more than likely be able to integrate your existing systems with the 123-txt platform to provide up-to-date contact information direct into the online interface. To discuss any SMS requirements, integrations or development, please get in contact. 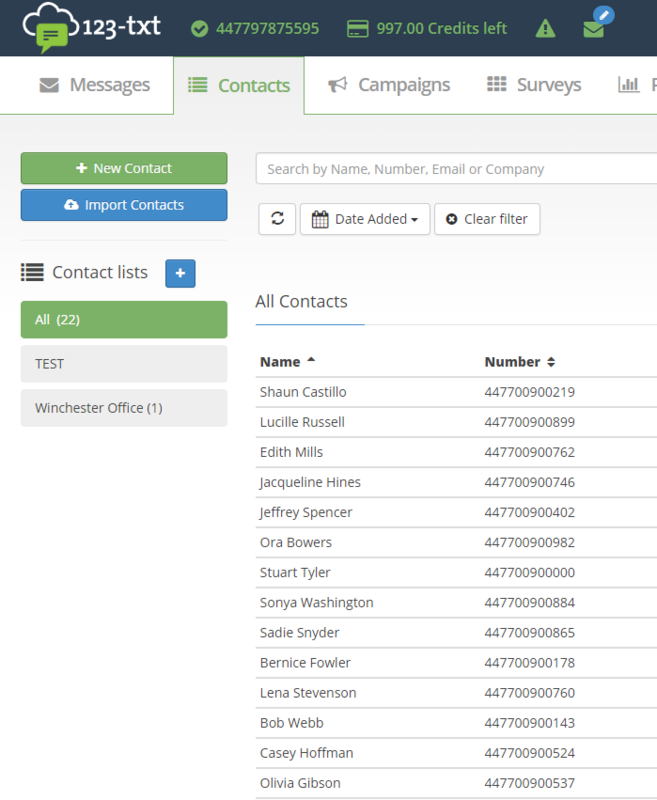 Contact lists represents the best way to organise your contacts and get the most out of SMS communication. Organise your contacts into relevant groups such as by office, department, region, marketing campaign etc. Track/keep records of opt-ins/outs, blacklists, etc. Lists can be created and added to on an ad hoc basis, as well as created when uploading a CSV. In addition to the usual contact fields, you can add an unlimited number of custom fields to help organise contact lists, personalise messages and automate some SMS related processes. If you have multiple users on your 123-txt account, they can create their own lists, as well as access shared lists. This means you can restrict access to lists if desired. When sending out an SMS communication that will generate a lot of engagement, throttling allows you to drip-feed to a contact list to help you manage responses. Keywords can configured to help manage subscriptions. For example, a ‘STOP’ message could be set up to unsubscribe a contact from all lists, whilst ‘MAILER’ could add a contact to your mailing lists. 123-txt is equipped with a data cleansing tool so that when you bulk upload, your contacts can be cleansed of duplicates and bad numbers. Useful for one-off marketing campaigns and info blasts. Access the entire conversational history of a contact from the contacts tab. Searchable and auditable, this is an important and easy to use tool when looking through historical interactions.